Hi, friends! It’s Friday again. Between working every day and learning the latest Les Mills group fitness choreography to debut for launch, I feel like this week went by even faster than usual. I’ve got a few hours to learn BODYPUMP 91 before teaching it tonight in my weekly Friday evening happy-hour class. Now in case you’re new around here, there are a few regular features on A Lady Goes West, and today I’d like to introduce you to “Friday Favorites.” It’s a chance for me to share a few things I’m loving lately, with no particular rhyme or reason. “Friday Favorites” posts are not exactly heavy reading. Scroll through, enjoy the fluff and then go off and have yourself a fabulous weekend. Ya hear? Lately I’ve been switching up my weekend adult beverages. Although I’ve been a chardonnay girl for a long time, I’m experimenting with martinis, fruity cocktails and even some sparkling beverages. Last week I was in search of something champagne-like with a grape-juice price and picked up this $10 bottle of Cupcake Prosecco from CVS, of all places. Chilled Cupcake Prosecco and the Vera Wang toasting flutes from our wedding. It is light, tasty and goes down a little too easily. Definitely a fresh adult beverage to enjoy before dinner, or with dinner, or just about any time. The tasting notes include creamy ripe lemon, honeydew melon and white peach. Sure. I just know it tastes good, and I’m certainly buying it again. 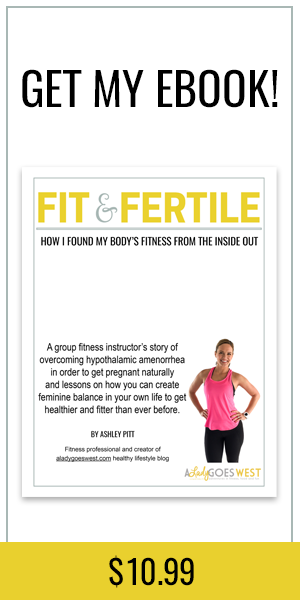 As a trainer and group fitness instructor, I spend a lot of time helping people correct their posture, strengthen their bodies and feel better. There are tons of resources out there giving correct and incorrect advice on how you can stand taller, but I know there are a few tried and true exercises that have helped me and helped others. I’d like to direct you to this comprehensive piece from Always Active Athletics called “The Posture Correction: Stopping the Pain.” If you look in the sidebars of the article you’ll see a familiar name quoted. Do you have an accessory or bag that makes you smile every single time you use it? One of the greatest gifts I received for my birthday many, many months ago (I’m a December baby, for your information), was this monogrammed pouch purse. My Mom bought this Stone Uber Clutch from GiGi New York for me and it continues to make me happy. It’s made from pure leather, is big enough to hold quite a bit of loot and fits nicely under my arm. 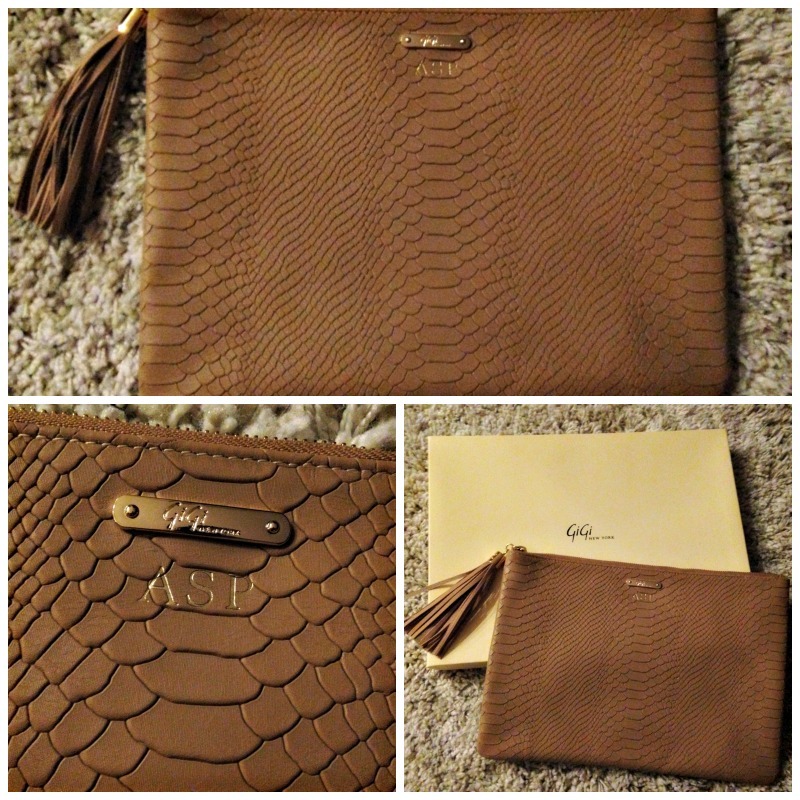 Embossed python leather clutch in the stone color from GiGi New York. I use it at least once a month when we head out on the town. And I love things with monograms. If you’re looking for a special gift for someone, I think this one is a winner. I’m reminded of it because I’m definitely going to use it tomorrow night. So I told Dave the other day that we never seem to take good full-length photos together. The only time I’m not in sweaty gym clothes is typically Saturday nights when we go out on the town. And usually it’s dark everywhere we go. The streets, the restaurants, the Uber rides, the Cheesecake Factory, you name it. 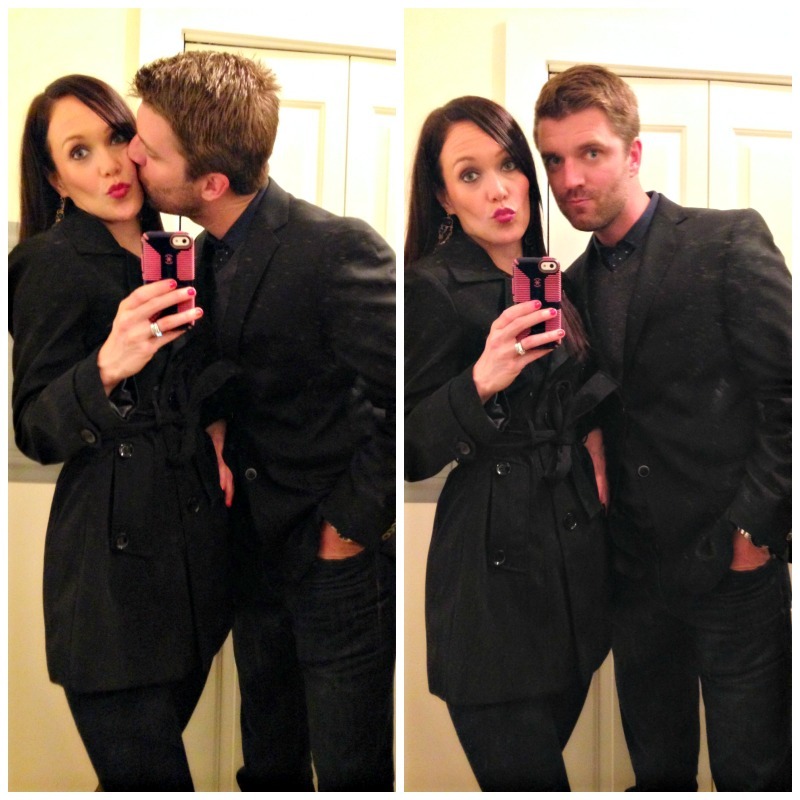 Before we left for dinner, I demanded that we try to take a good photo of ourselves in the mirror. Photo session completed in our the very small hallway of our apartment. It took five minutes to come up with these, and I laugh out loud when I look at them. It’s not easy to take a picture of yourself in the mirror, especially of two people. And as you can see we’re not good at the whole selfie thing. That’s why I don’t post pictures of myself after every class I teach or workout I complete like so many other fitness buffs. It ain’t pretty. I don’t know how people are able to take such good pictures of themselves, in fact, I applaud them. At midnight tonight the contest to win Shakeology single-serve packets ends, so enter today. And while you’re there, read up on what it’s like to be involved in Beachbody from a program coach. This has been my most popular contest to date, and I’m so glad you’re all interested in trying such a great product. Alright, that’s it folks. After my class tonight, Dave and I have plans to go to dinner with a special visiting guest tonight at our usual neighborhood sushi spot. And then we’re heading out with some other friends to a new restaurant in the Hayes Valley neighborhood tomorrow night. Hope you have a good one! Do you want some more “Friday Favorites” posts? For the previous editions see below, and visit the the link-up hostess, Heather. Do you have a favorite alcoholic beverage? If so, what is it? What’s in store for your weekend? What kind of purse are you using right now? Oh man I am IN LOVE with Presecco! We usually order it on our girls nights especially when we are celebrating! My fave drink is probably a mojito or a white wine spritzer (cue my inner 80 year old self), they are both just so light and refreshing and never leave me feeling full! I am not a huge ‘purse’ kind of gal, I love just carrying a wallet but I got a really cheap and good sized bag from Old Navy that fits everything I need, plus I love rocking ANY kind of clutch !! I have WAY to many to count! Have a great weekend! Good luck at Pump tonight! Presecco sounds lovely right now! I would happy have a glass! haha love those cute selfies- just want I do with my boy! Carrie (This Fit Chick) recently posted…Berrylicious Pre-Workout and Drippy Eggs! Hi Carrie, I’m sure your attempts will be better than ours. Happy weekend! Prosecco is one of my favorites too! Have a great weekend. We also got the cake cutter in the love knot pattern too. And you take a pretty good selfie! 🙂 happy Friday. Yes, you’ve got to come to one of my classes once you’re ready! Happy Friday! Ooooo I’ll have to check out that Cupcake Prosecco! Sounds yum. And you can’t beat that price! I like most of the cupcake wines, but Korbel Natural Champagne is my favorite. I also like a good moscato d’asti sometimes. 🙂 That clutch is beautiful! I’m going to have to go check out their stuff since I’ve been on the hunt for a smaller bag lately. Hi Jessica! Thanks for stopping by. Yes, I’m a big champagne fan as well. It just seems celebratory no matter when you have it. 🙂 Hope you have an awesome weekend … I’m sure you will be taking gorgeous photos of adventures. I love that your clutch is monnogrammed! I still find it funny that you can buy liquour here in almost every store I walk into. In Canada, we have similar to (what is here) BevMo, and that’s it. Apparently us Americans like our drinks. 🙂 Happy weekend, Nancy! I absolutely LOVE Prosecco! Can’t believe you found it at CVS?!! 4 oz Prosecco + 1 oz Aperol + splash of soda = heaven. Awesome… I’m not familiar with Aperol. Thanks for the tip. Cupcake anything is perfect I love all their wines they are a perfect fun bottle for a perfect fun evening! Hi Renee, Agreed. And the price is right. Hope you have a great weekend! Prosecco reminds me of being in Italy! I drank a lot of that there. That clutch is super cute too. Jen @ Pretty Little Grub recently posted…FYI Friday – Fats…what’s the deal? Your Friday faves is so cute. 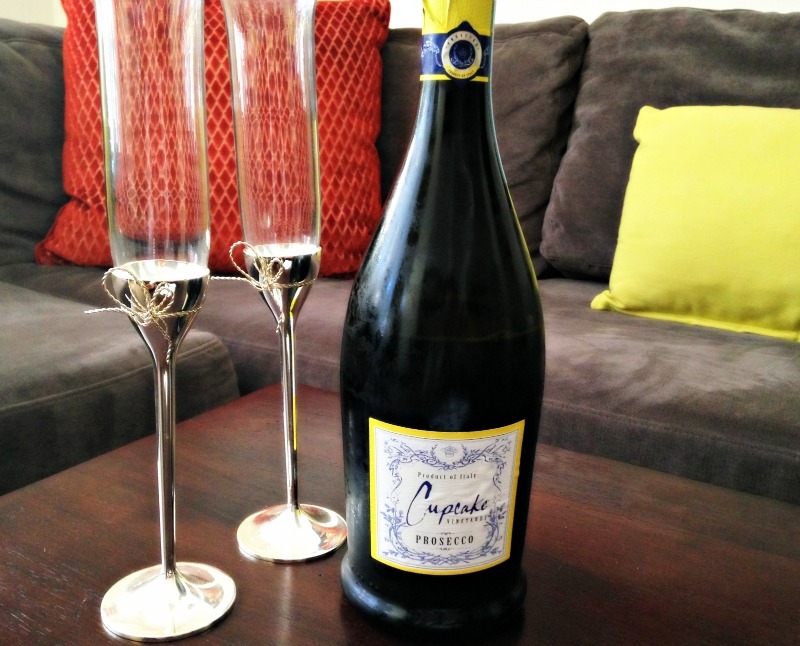 I’m a huge fan of anything bubbly, so I’m definitely going to go out to find this prosecco. Plus the brand is cupcake and I’m obsessed with cupcakes.